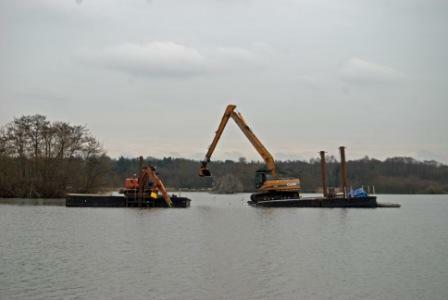 Visitors to Fleet Pond will have enjoyed watching the mating dance of the two giant cranes. Dipping their long necks into the water and offering gifts to each other of mud. Their nests now built and ready for the breeding season, reminiscent of the mud nests of flamingos, the cranes will rest from their labours until August. 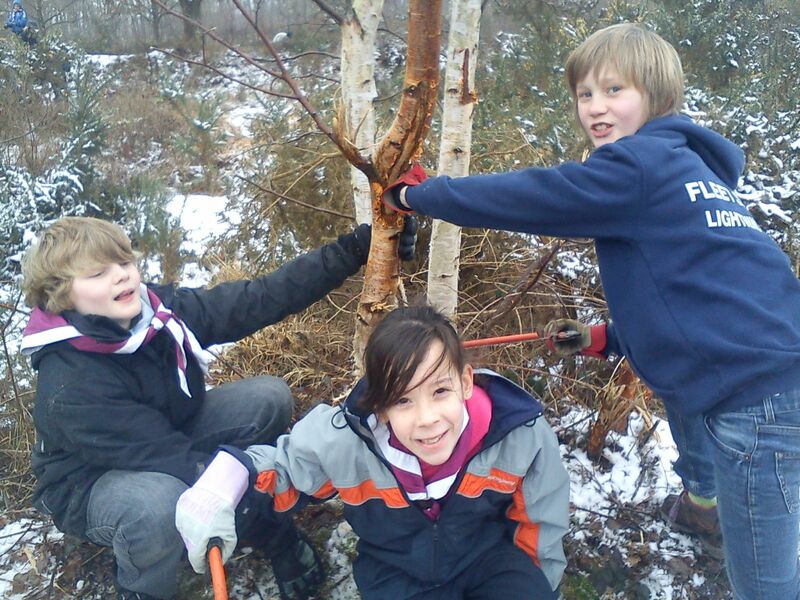 Guides and Scouts unite for a Community Challenge for the Queen’s Diamond Jubilee! Thousands of Scouts and Guides from across Hampshire have come together to work on community projects to celebrate The Queen’s Diamond Jubilee. As part of their promise to serve The Queen and country, both organisations are reaching out to help their local neighbourhoods between 6th February and 30th June. Activities could range from litter picking, providing food and shelter to the homeless, revamping skate parks, preserving the area’s wildlife, and much more. 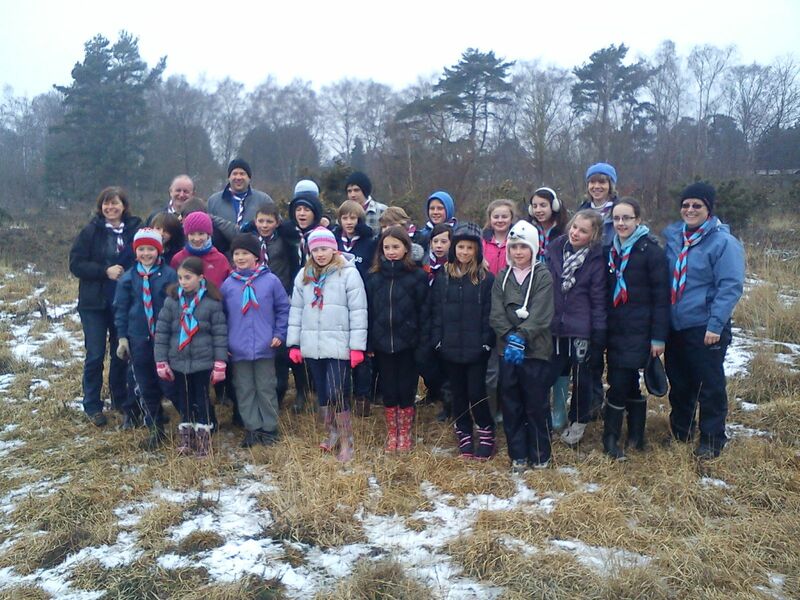 It was -1oC (on the 12th February) when 30 representatives of 7th Fleet Guides and 29th Odiham Scouts (plus 12 parents) arrived at Fleet Pond to assist Fleet Pond Society in their conservation work. The plan had been to clear birch seedlings from the Dry Heath area – a mixture of digging out the smaller roots and cutting the bigger ones with loppers and bowsaws. After a week of freezing temperatures, however, the ground was solid and digging was not an option. Not to be deterred, the volunteers set to work cutting down the seedlings. A large fire was soon underway, fed by the seedlings cut down by the eager volunteers. “A chilly morning was filled with log chopping with saws – it was the first time I used a saw on my own! A great fun way to spend a couple of hours on a Sunday morning,” enthused Laura C of 7th Fleet Guides. 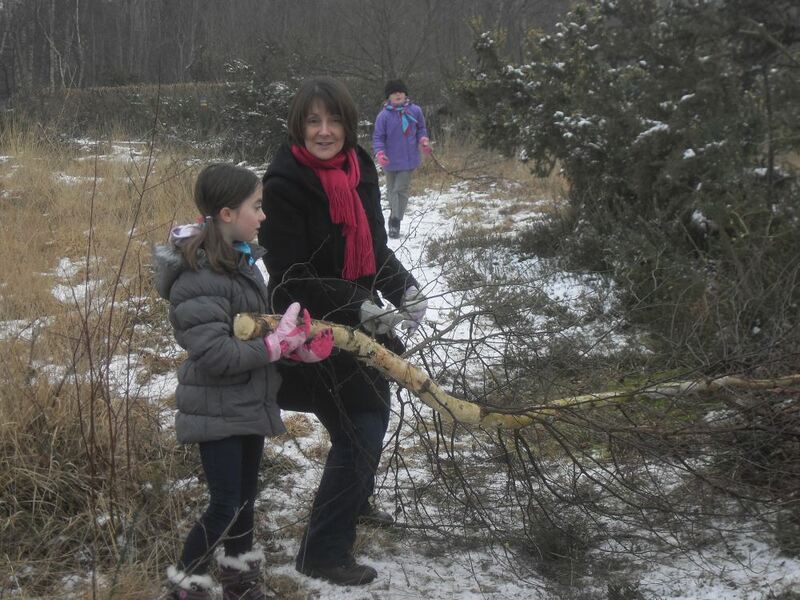 “Not only was it great fun, but we were helping preserve the heathland for visitors and the wildlife,” said Nick B of 29th Odiham Scouts. In case you’d like further information on these organisations, please see Girlguiding in Hampshire North and Hampshire Scouts. 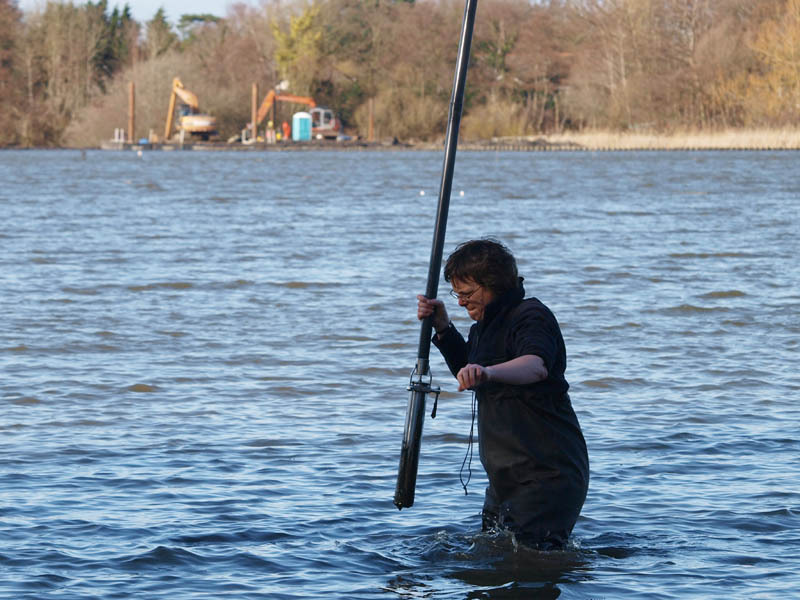 Silt Sampling Near Kenilworth Jetty – Tricky Progress! 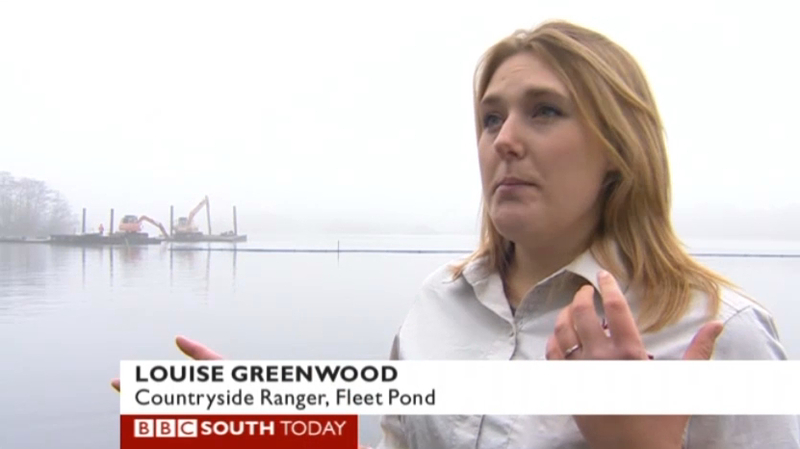 Last Wednesday, Genevieve Madgwick and Cressida Wheelwright of Natural England (NE) visited Fleet Pond to look at the progress made on the Restoration Project. 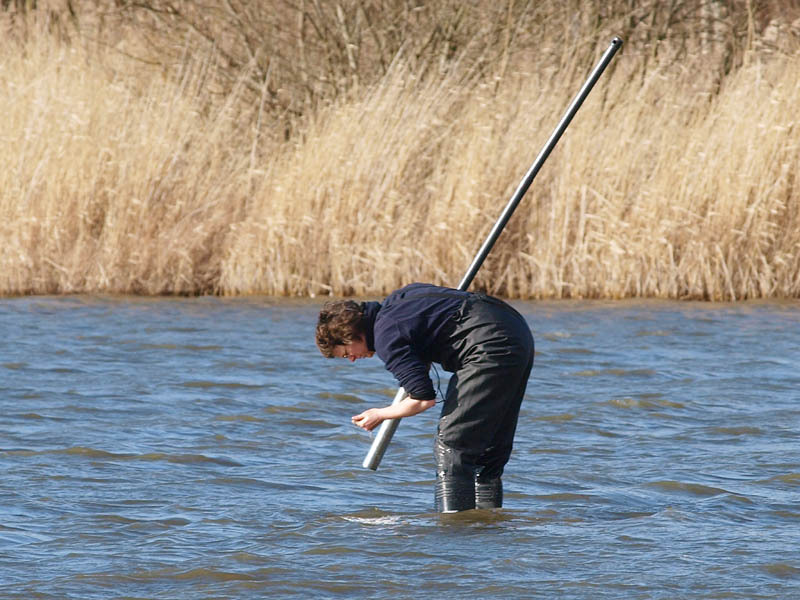 This included taking some initial core samples to see what the silt comprised of in terms of soil types. At this stage Genevieve did not take any samples away, rather she examined them by eye on site. Also present were; Steve Lyons and Louise Greenwood (Hart Countryside Services), John Sutton and Alex Hazel (Environment Agency), Becky Lemon and a PhD student (Johns Associates), and Colin Gray (Fleet Pond Society). Damian McGettrick of WM Longreach, who are the chosen contractors for the project, also joined in for part of the tour. Genevieve and Cressida also saw the clearance of the marshes whilst at the pond and were very supportive of the overall progress made. The marsh restoration work has been made possible as a result of funds obtained by NE under a Higher Level Stewardship agreement with Hart Council – please see here for further details. Hope to see you there and all new volunteers are very welcome! Further information on the Sunday volunteer tasks (including where to meet etc) is available here. 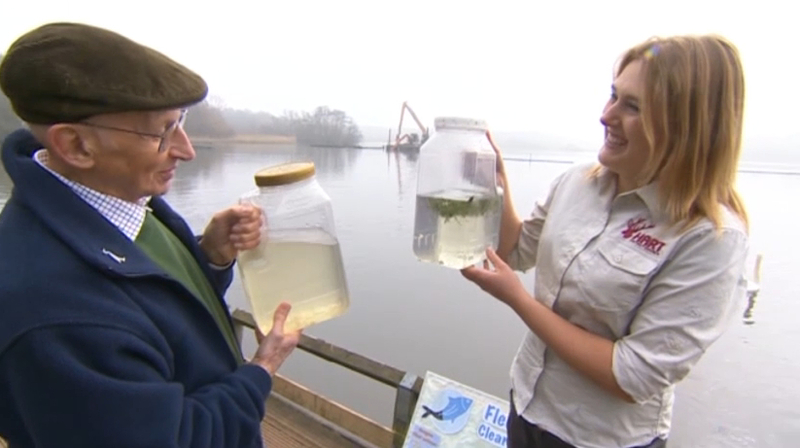 The Aim: From Silty To Clear Water! 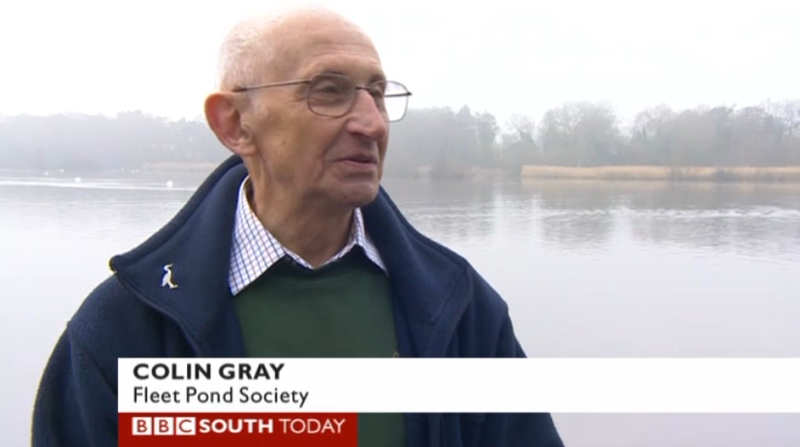 In case you missed it on BBC South yesterday, please take a look at this link (click the arrow on the lhs to play the clip). 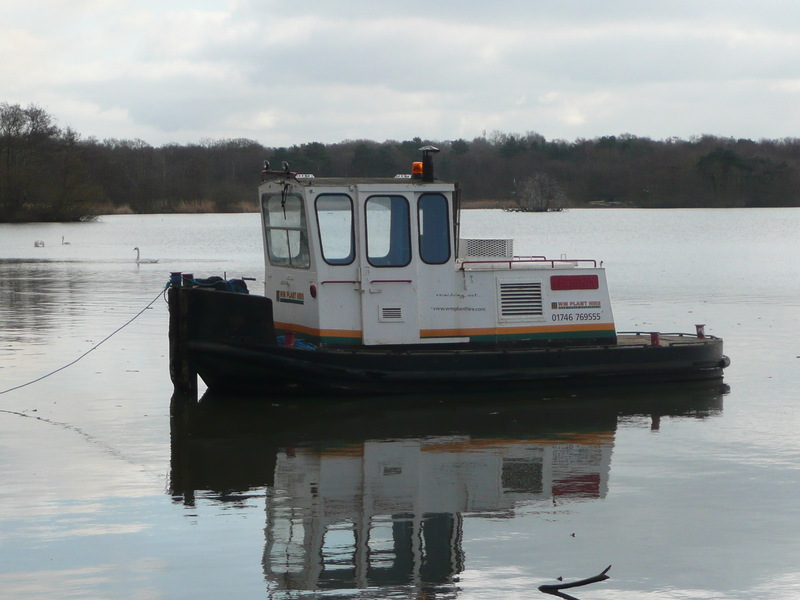 The section on Fleet Pond runs from 14′ 30″ to 16’45” (just drag the cursor to that time slot). The link appears to be valid until 6:59PM Fri, 2 Mar 2012. For further background, see this post on the Restoration Project. If you would like to join Fleet Pond Society to help in the upkeep of the Pond and to support the Clearwater Campaign please see the joining details here. 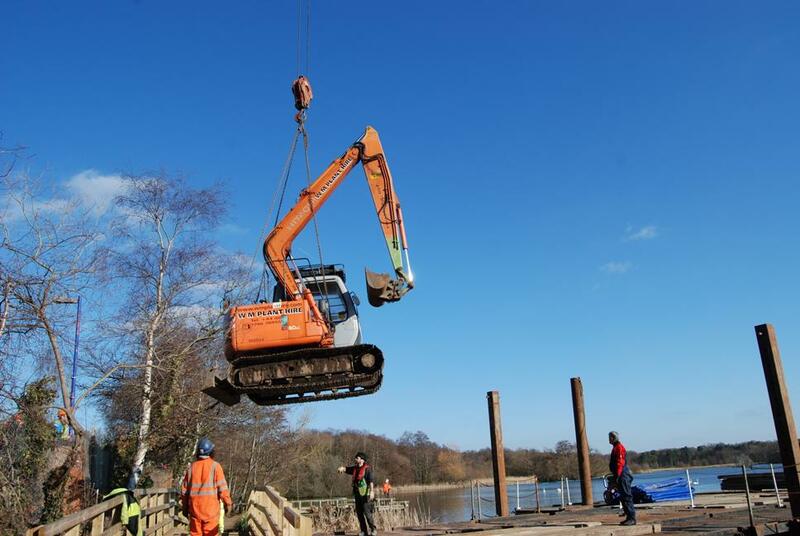 Hart District Council has successfully appointed it’s preferred contractor to take forward the Fleet Pond restoration works. This is WM Longreach. 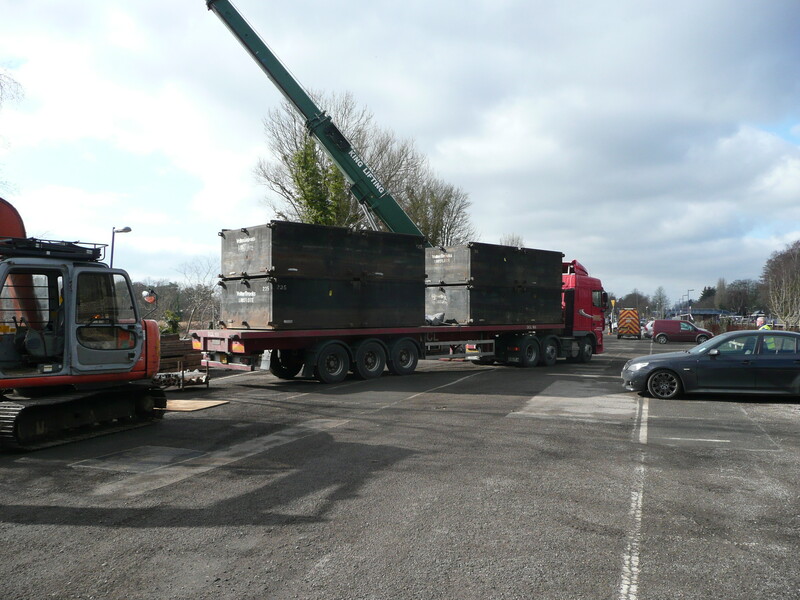 The first phase of the works has commenced this week, starting with the delivery of materials and equipment, establishment of the construction compound and marking out of the boundaries of the dredging and island creation areas. 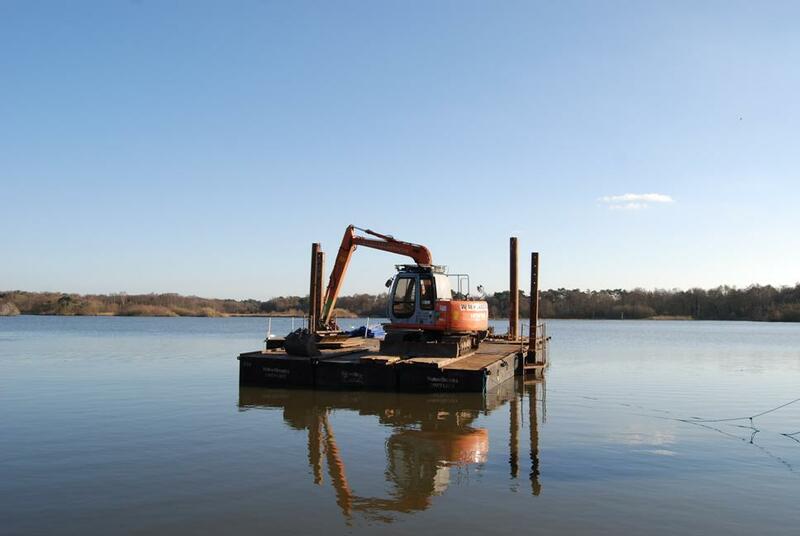 The main dredging pontoons and tug were launched into the pond via a crane last Saturday (25th February). 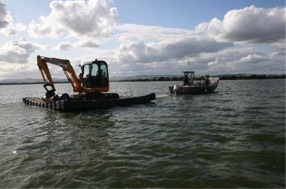 Works to dredge parts of the lake and create the first set of islands will then continue until the end of March 2012. Fleet Pond Rangers will be putting information on the boards around the pond and will be on hand to advise on safety aspects. 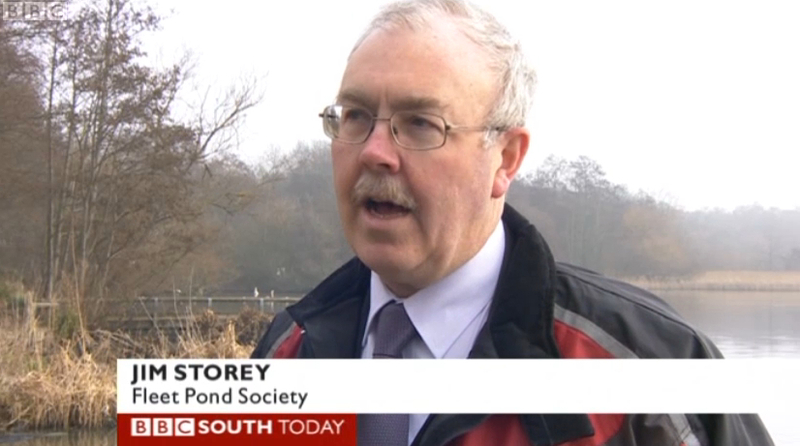 This is the start of very exciting times for all involved with Fleet Pond! Ed. Matt’s introductory post on the Restoration Project is here. Photo credits: Michelle Salter (top and bottom), the smaller one was provided via Matt Johns and the remaining two are from me. You are currently browsing the Fleet Pond Blog blog archives for March, 2012.